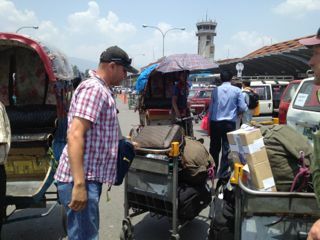 Arrival in Kathmandu is rather dreadful. The huge jet pulls up about 20 feet from a red brick building. You could walk easily to it but passengers must load up on a bus and be driven in a U-path to the building. Good for gas. The immigration process is not lethargic as you enter the building which is cast in sort of a body odor that’s not pleasant. 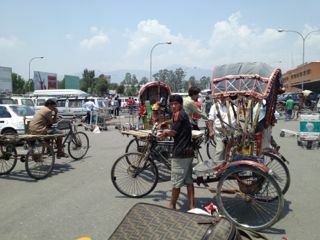 But when your on the spot visa is installed in the passport, and your pile of luggage (trekkers always have huge bags) is on a push-cart which wants to go everywhich direction but straight, and you walk through the well-smudged glass doors, you are confronted with masses of Nepalis anxious to help you out - for rupees. It’s hot. It’s crowded. Everyone needs a bath. Their clothes are a shade of red tan as are their feet. Most need a hair comb. They look at you as if you are some foreign animal - which we probably are - and since the country was under a governmental strike, there were no taxis - just a couple of rickety bicycle carts (rickshaws). The only vehicles allowed in the streets, without being attack, are tourist buses with a paper designating such on the front. It took about a half hour before our bus could even get to us. We shared it with two families here to study new found ancient caves for National Geographic. Have I said it was hot? It is steaming. My head is sweat wet. No one offered bottled water (you can’t even trust the bottled water here, I’m advised.) Worn out from two days of travel I was getting impatient to get out of the airport parking lot. Crowds were crowding in. I began to get philosophical. Are all these folks going to be in heaven? Will I have learned to cope by then? When I get in a crowd and get antsy, itchy, claustrophobic, nervous, fearful - I re-check myself and wonder - how am I going to deal with it if all these people outside my comfort zone are in my lane in heaven? I’m not being judgmental. These are the needy, the overtly poor, the hungry, the scoundrel, in Hindu terms, the lowest of the karma folk. Am I one of them? I hold on tighter to my bags, about to tilt off the trolly. And try to balance on one foot and stretch my back. By the time all the giant bags were loaded into our van, there was hardly room for us. But we’d take that. The vehicle was air-conditioned. Ironically, the airless streets, usually packed with walkers, carriers, mo-pedists and motorcyclists, were tame with giant cows laying around, chewing cud, knowing they are holy pieces of the system and no one can do a thing but worship them. A herd of black goats were shepherded by. It’s chaotic. The tourist bus turns down one lane streets only to meet a bus coming at us on the wrong side - then I remember it’s British style. Everyone inhales. 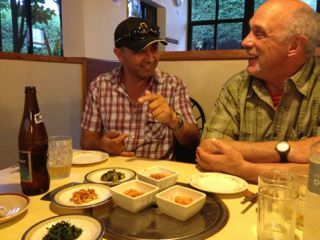 The local agent G-ban invites us to dine at a small popular Korean restaurant within walking distance. It’s called Villa Everest and is patronized by climbers and mountaineer types gathering the latest stories from Everest Base Camp as they downed Everest beer and Himalayan water. Four people have just died descending from the summit. There are 35 outfits with 335 clients acclimatizing at base camp, waiting to tackle the impossible trek to the summit. The old timers agree: that’s too many, too long a wait on the climb, too dangerous a number. The Korean dinner consisted of small dishes of vegetables and chicken, red with hot spices. It's called a Kimchi and included radishes, cucumber, cabbage, bean sprouts, spinach and tofu. 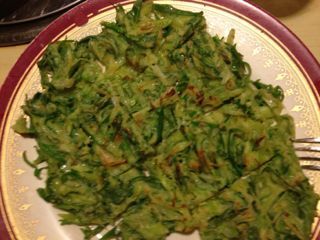 My choice was a vegetarian pancake - a whole bunch of chopped green onions and broccoli cooked with a little rice flower - delicious for picky me. Maybe tonight I'll eat without a grumbling stomach. ARE YOU SURE YOU ARE WHERE YOU WANT TO BE? IS IT POSSIBLE THAT YOU TOOK A WRONG TURN SOMEWHERE ALONG THE WAY? PARADISE OR SHANGRI LA WAS IN ONE DIRECTION AND KATHMANDU WAS THE OTHER WAY. MAYBE NO ONE LEFT ANY BREAD CRUMBS FOR YOU TO FOLLOW!!! FOSTER CARE IS ON STRIKE THEY REFUSE TO DO ANYTHING UNTIL YOU RETURN. HURRY HOME! This is great stuff Audrey. I'm taking notes for my trip to Kathmandu this fall. We have to have coffee when you return. Our girls were great at the end of year performances last week. We all missed you. There's a photo on my facebook page and more to come. Keep the commentary coming and travel safe.